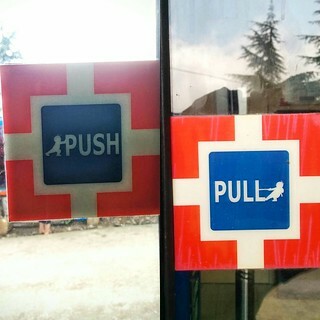 It is instrutive to see how Pull drives knowledge exchange, while waiting for Push to deliver. A few years ago we worked with a major organisation, setting up communities of practice as part of a knowledge management approach. It's an organisation of fragmented parts, which have recently come together under a single umbrella, and they chose communities of practice as a means to exchange best practice around the organisation. The steering committee were very keen on best practice exchange, setting a target number of best practices for each CoP. Welaunched the communities, and set up a series of meetings (they don't have groupware in place yet) to begin to discuss candidate best practices that could be shared and replicated. That's when serendipity took over. In most of the communities, sharing began to happen organically as a result of the connectivity and relationships that had been established across the previously fragmented parts of the organisation (as you might expect!). As well as working on these candidate best practices, the community members began to tap into each other for help and advice. Knowledge began to flow around the communities, fuelled by Pull (asking for help), long before the best practices have been successfully Pushed from one part of the organisation to another. In one case, this informal sharing saved in the order of £100,000. Many best practices have been identified, transferred and implemented for business benefit, but it was striking (though perhaps not surprising) how informal Pull delivered three success stories, while we were still waiting for Push to pay off.